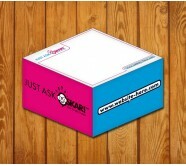 Custom non-adhesive paper cubes offers high dose of brand exposure due to their design and high purpose value. You can get your brand logo and company name printed on all sides as well as on paper for better visibility! NotepadsDirect.com offers wide selection of multi-sized promotional non-sticky memo cubes in different sheet sizes, sheet counts and imprint options. Unlike sticky notes, recipients can use both front and back of these non-sticky cubes for writing. 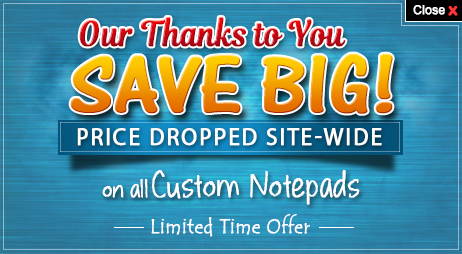 Free artwork and free online design proof, safe and secure shopping, attractive bulk discounts are a few of the benefits that you can expect when purchasing these custom non-sticky memo cubes from Notepadsdirect.com. If you want to keep your brand information to remain visible from all angles, these custom memo cubes (non-sticky) comes as a handy option. These logo printed paper cubes can be used as a handy writing pad as well as a paperweight. When placed on desktop or worktable, these cubes will continue to remind users of your brand. Invest in this attractive product and enjoy value effective promotion with minimum efforts! Everyone loves promotional memo cubes, so it is for sure that whoever receives it is going to showcase it over their desktop tables. They can use it for writing and improving their dull desktop decor. You can gift these logo printed non-sticky memo cubes to the public during trade shows as it will help to cast stronger impressions and boost brand loyalty. These affordable non-adhesive paper cubes also make an indulging giveaway during fund raising events, corporate events, individual milestone events or other event where you wish to educate people about your brand. You can gift away these non-sticky memo cubes at the office, if you strongly desire to improve work behavior and generate a sense of responsibility in them. You can seek these memo cubes in your preferred shape and size that matches your promotional requirements, fits into your budget and offers large scribble space for your target audience. If you do not see the custom non-sticky memo cube which fulfills your promotional requirements, feel free to reach out to us at 855-866-8372 or write to us at info@Notepadsdirect.com.